The names on the marquee may be Thao and Mirah, but it's tUnE-yArDs' Merrill Garbus who gives this collaborative project its identity. As idiosyncratic singer-songwriter types with musical personalities strong enough for them to go by their first names, Thao Nguyen and Mirah Yom Tov Zeitlyn are probably as amenable and well-suited as they come to pairing up and sharing the spotlight. Sure, it doesn't hurt that they more or less share a similar indie sensibility and overlapping underground audiences, but there's something about their approaches that seem particularly compatible and complementary. in the dynamic duo, Thao takes on the headlining role, not just due to possessing bigger and more current profile, but mostly because her party anthems for misfits and underdogs are more extroverted -- as she once described her music's raison d'être, "Sad people dance, too." As a counterbalance, Mirah's the introvert, someone who creates mini pop symphonies that can conjure up worlds all their own. In short, there's not much of a chance that Thao and Mirah will be singing over one another or stepping on each other's toes, which is a good enough starting point for a collaboration. But while the names on the marquee may be Thao and Mirah, it's tUnE-yArDs' Merrill Garbus, on board as a co-producer and guest musician, who gives the project its identity. Indeed, her role feels much bigger than what she's credited for, made clear by the opening track "Eleven", which actually resembles something from a tUnE-yArDs album more than it does either a Thao or Mirah effort. That "Eleven" doesn't really recall Thao's indie folk and Mirah's low-profile pop says something about the artistic inspiration Garbus brings to the affair: With the principals sharing vocal duties and blending their distinctive voices seamlessly on "Eleven", Garbus resourcefully provides a ramshackle backdrop, full of tribal rhythms, lo-fi techno instrumentation, and even a taste of the African thumb-piano sounds from tUnE-yArDs' w h o k i l l. And yet, the variety and diversity of styles on "Eleven" never take away from the esprit de corps of these comrades-in-arms, culminating in the way Thao and Mirah spiritedly sing the refrain "When love is love / Don't let it go away" in unison. So even if Thao and Mirah stand front and center on the eponymous album, Garbus often provides the connective tissue behind the scenes, helping to lift the record from side-project novelty to a work that stands on its own terms. Most notably, the suggestive duet "How Dare You" is more steamy and sultry in tone than either Thao or Mirah can muster on her own, role-playing as ex's engaging in post-breakup pillow talk ("No, you can't lay there / That's where we used to sleep," Mirah coos as coy as she can be). But it's Garbus' mood music that sets the tone here, with a thrift-store drum machine and plinky keyboard lines adding depth to Thao's and Mirah's R&B-tinged intonations. Same goes for "Rubies and Rocks", on which the play of clattering percussion, low-end rhythms, and toasting horns lends Mirah's lo-fi soul vocals more heft with a funky, groovy vibe. 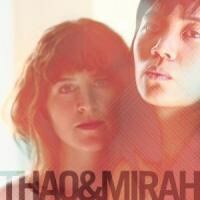 There are, of course, those moments on Thao and Mirah that nicely showcase their individual strengths as songwriters, even if those efforts aren't quite as ingenious and compelling as the collective endeavors. While Mirah's voice and eclectic aesthetic are better suited to blending in and going with the flow, a dusky indie-folk number like "Little Cup" would definitely be filed under her catalogue, as would the pretty ditty "Spaced Out Orbit", which adorns her fragile pop tones with some tasteful electronic frills. Most of Thao's songs here are reminiscent of her work from her dayjob in the Get Down Stay Down, though that has a lot to do with the fact that she can't exactly downplay the languid, marble-mouthed drawl of her vocal delivery. The acoustic track "Folks" bears Thao's trademark twang-pop guitar and helter-skelter rhythms, while "Teeth" accentuates the gentler side of her music, with her acoustic guitar and relatively hushed voice matched by handclapped beats. On the other end of the spectrum, the boisterous "Likeable Man" shows off Thao's trickster side to strong effect, its gangly stop-and-start moves going nicely with some out-of-tune brass and free-jazz freakouts to punctuate her herky-jerky folk. All in all, there's not much to quibble with a full-length that breaks down to a good Thao playlist, a solid Mirah sampler, and an EP's worth of original collaborative material. It's just that the teamwork between those involved comes so easily that you want to see how much further the partnership can push itself, which is the impression that the standout closing track "Squareneck" leaves you with: As Thao's rhythmic melodies, Mirah's subtle touches, and Garbus' kitchen-sink orchestration all fall in together spontaneously and naturally, "Squareneck" is a case of everyone doing what they're best at to create a whole that's greater than the sum of its parts. It gets you to hope that this is just the start of something bigger and better, and that, next time, Thao and Mirah can make more room for Merrill, maybe in the title even.